I had a very busy day at work, I was very tired, so one of those slow moving, scarcely talking movies, with long pauses during conversations, was not my cup of tea (or cup of film) for that evening. It’s one of those features where every character philosophises about the nature of life and death before answering "Yes" to "Do you want some bread with your dinner?" And you want to shake them out of their nihilistic silence and make them scream to your face everything that's in their mind, rather than having to decipher for yourself what does the imperceptible noise of tree leaves mean, for over what seems more than five minutes. Having said that, and still battling with myself at some point to try not to stand up and slap the face of some of the characters, and find myself slapping the screen instead, I enjoyed it overall. It was just my tiredness, I thought. But as the story developed, it got more interesting, and I found myself getting more and more involved with the main character, Sushenya (played by Vladimir Svirskiy) and his curse. And his curse was to be alive. 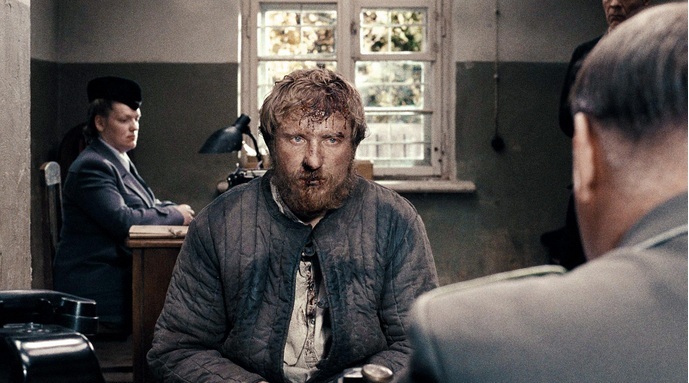 In the fog is the second feature film by Belorussian director Sergei Loznitsa, based on the novel by Vasili Bykov, a prolific Belorussian writer. Loznitsa is mostly known for his documentary films. His first feature My Joy, was selected for the main competition in 2010 Cannes Film Festival, and was awarded the Best Director's prize. Two years later, his second film competes for the Palme D’Or, and is awarded the FIPRESCI prize. Loznitsa collaborated with cinematographer Oleg Mutu, who had already worked with him on My Joy. 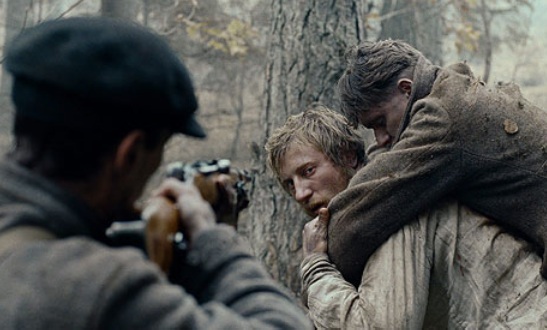 In the fog tells the story of a man who escapes fate (being hanged with his other partners in crime at the beginning of the film) during the German occupation of Belarus during the Second World War. And this turns into his curse: being alive is his curse; carrying the shame of being wrongly accused of treason over his shoulders, is his curse. And he escapes fate over and over: there are multiple occasions when he is about to be killed but somehow he ends up living. Even his executioners, Burov and Voitik (played by Vladislav Abashin and Sergei Kolesov) die before him. And since fate seems to not follow its natural course - as if teasing him - he decides to take matters into his own hands, and ends up (spoiler warning) killing himself. The feature film In the fog is a poetic affaire, where cinematography speaks for itself: it is the framework that lays the foundations of the story and binds everything together, giving it meaning. The way it's shot reveals the characters’ feelings: it is common to show the characters looking straight at the camera, uncovering everything they feel with their stare, having nowhere to hide. And then the other extreme: when the main character, Sushenya, leaves the German’s quarters, carrying the shame with him, which he's not even responsible for, he's shot from behind. They show the back of his neck as he leaves, displaying that shame, and hiding his face and his feelings. The camera is metaphorically their mouth or their heart - a way for the characters to communicate with the viewer. The camera speaks for itself, it almost has a life of itself, and this is why the extremely long shots, the hand-held camera work mixed with more traditional techniques, depending on the situation the director and cinematographer want to convey. In this film, words didn’t tell the story, acting did. Even in the climax of the tale, words did not have the desired effect, and were of no assistance: in two occasions the main character tries to release his pain by sharing it with his fellow executors. We sense a minuscule moment of hope to be understood, and as he tries, his confessor dies in the act. In the other attempt, his listener hears but does not listen. Conclusion: there’s no hope. At least in life. And it is at this moment when you feel his void, loud and clear. And painful. This is why he ends up killing himself. All in all, it’s the story of a man on a journey to his death, accompanied by his two executioners. And Death is almost another character, always present. It displays life during war time to the extreme of absurdism - as any war would - where it's not Death who chases its victim (as in The Seventh Seal by Bergman) but the victim itself who chases Death, who mocks him, over and over. But Sushenya ends up winning (or losing, depending at how you look at it) at the end.